Hole diameter Ø 5,0 mm. From certified production. Don´t forget nails ! 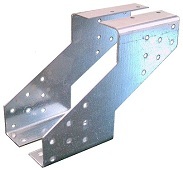 Timber connector for blunt connections to adjacent lying purlin. This connector can also absorb forces transverse to the direction of purlin. Hole diameter 5,0 mm. From certified FMG production.